What are Fractions? Why do we need them and how to introduce them to young kids? Fractions are the parts of whole numbers or part of a group of objects. This page contains basic fraction worksheets and lessons to kick start the fraction learning. Print the following lessons and worksheets to introduce the concept to young kids. The above lessons and worksheets are the base to fractions. Make sure young kids are very comfortable with the idea and then proceeds to higher levels. As said earlier, when whole numbers are unable to represent parts of an object (such as slices of a pizza), we need new type of numbers, which we call fractions. Step by step lessons and worksheets on this page are there to explain and practice it all. You just need to encourage your kids or students to go through all the lessons and solved examples before giving them our free fraction worksheets. Once kids have understood the lessons and solved examples, then it becomes very easy for them to finish the worksheets or problems given in class quizes or tests. This page contains number of basic fraction worksheets for kids in grade one to grade four. These worksheets build on as you go down this page. Worksheets to introduce "one quarter" or "one fourth"
We always urge students to learn the basic concepts before moving to higher ones to get the best results. Teachers can read more about the research on fractions by visiting the highlighted site. 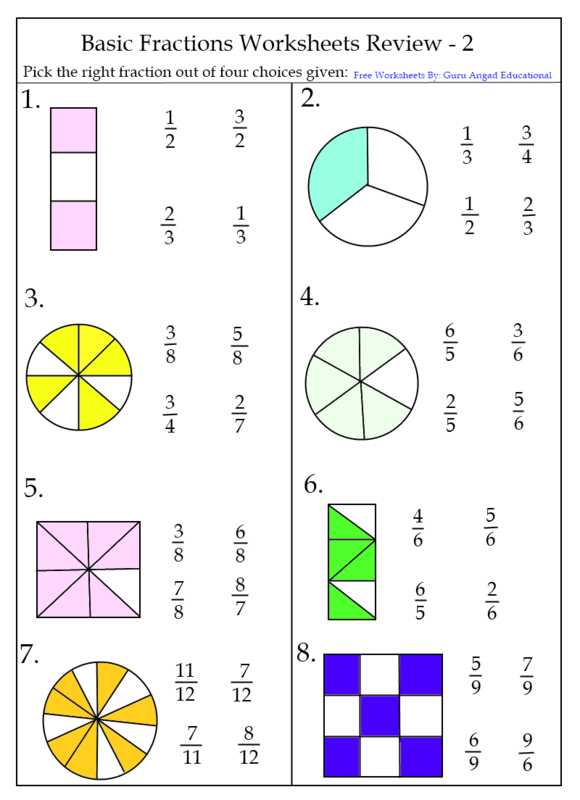 Print all of the free fractions worksheets on this page to teach kids about the elementary concepts of wholes, halves and one quarters. All the following worksheets build on the skills achieved after doing all of the first grade fraction worksheets given above. 2nd grade kids can use all of the following worksheets but some of these worksheets are grade three level. Fractions can be represented as the part of a group of objects or persons. For example; out of 12 students, 3 forgot to do their homework, and this can be represented as a fraction. 3 students of 12 is also one fourth of students or quarter of the students forgot to do their homework. 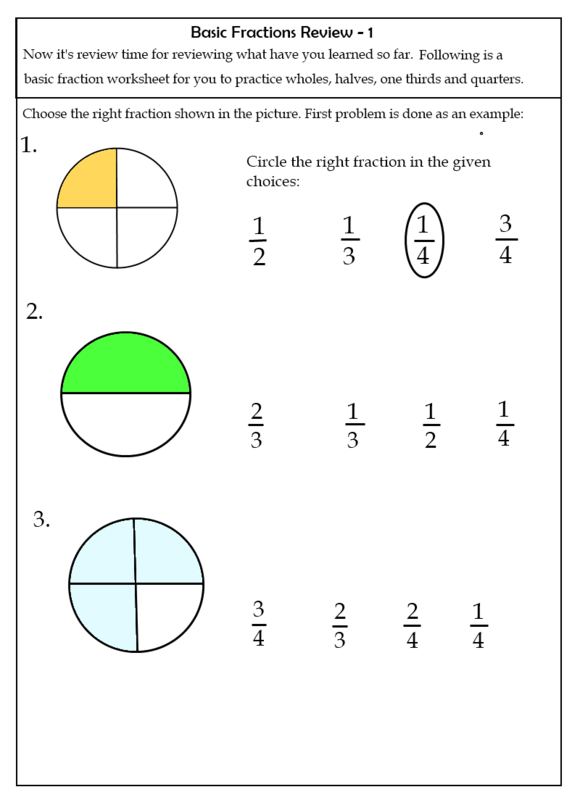 Below are the fraction worksheets to practice writing part of a group of objects as fractions. Hope kids will enjoy these worksheets and advance their knowledge of the concept further. Most of the fraction lessons and worksheets for grade four math start with the knowledge of equivalent fractions, but the following lessons and worksheets can add some extra knowledge for grade four students. Hence all the basic fraction worksheets to aid your kid's fractions learning in elementary grades.